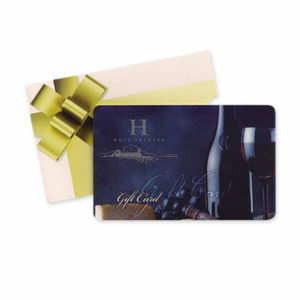 We are offering Gift Cards in amounts up to $250 per card and can be used at the Inn and/or Winery. Huff will continue to share its family passion and history of the land by producing exceptional wines sourced from well-maintained vines complemented with the finest of winemaking expertise. We will continue to grow by creating brand value as well as continuing to offer an incomparable authentic experience. Our aim is to create a unique destination and provide not only fantastic wine but also accompanying aspects such as great food, fine art and luxurious accommodations offering an experience which resonates with our customers.